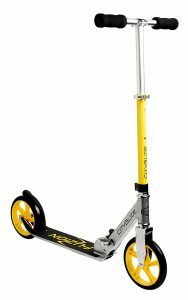 We all rode kick scooters when we were kids. They are fun to ride and also very effective as a short distance commuter. But hey, if you want a kick scooter now, you can definitely have one. They are eco-friendly, compact, and easy to ride. But there are a lot of kick scooters available in the market for adults now. So just for your ease, we have chosen ten of the best kick scooters which are good for an adult to ride on. Without further ado, let’s check out what we have for you in our list. Micro’s scooter for adults is a premium priced commute you can get in the market. But this scooter is worth every penny. The overall build quality and design are outstanding. The body of this scooter is made with aluminum. So the frame is very strong and light. The scooter weighs 10 lbs but can withstand a rider of up to 220 lbs. This adult kick scooter gives a very comfortable ride thanks to its heavy wheels that have a thick layer of soft, high-rebound urethane. These wheels are 200 mm in diameter and they are perfect even for a hard and rough surface like concrete. The Micro Black also uses standard 8 mm bearings which also makes the ride smooth. You can also replace these bearings very easily with a higher quality one if you want. The handlebar is adjustable with a range from 72 cm to maximum 103 cm. This makes it suitable to ride for a rider of any height. The handlebar is also 360 degrees rotatable. So if you want to pull some stunts while roaming on it around your neighborhood, then you are in luck. The bike is also a compact one and folds very conveniently. So if you want to carry it around while not riding it, you would not be in trouble. Also, all the parts of this bike are replaceable, so if any part needs to be replaced, it can be done very easily. The scooter is also available in two colors, white and black. Whatever color you choose, you will get one with a nicely done paint job. This scooter has a very simple and classic design. The maximum weight limit on this scooter is 220 pound. It folds down easily for convenient storage. This scooter is equipped with 200 mm polyurethane wheels on both rear and front. 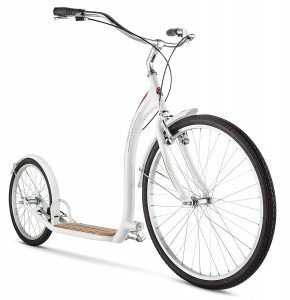 The handlebar is adjustable within a range of 26 inches to 38 inches from the deck. Aeroactive is another name in the premium list of adult kick scooter. There is no compromise on the build. This kick scooter has an aluminum frame and the deck is also made of aluminum. But the lower portion of the deck has some plastic. It is a mid-weight scooter weighing almost 13.5 lbs. A rider weighing up to 220 lbs can ride it without worrying anything. The T-bar is adjustable like most of the kick scooters. It has three levels of height adjustment, 41 inches being the maximum height and 37 inches the minimum. The wheels are PU wheels with 200 mm diameter. PU wheels are strong and very smooth to ride. These wheels perform flawlessly on rigid surfaces like concrete and also on gravel surfaces to give a smooth riding experience. To provide extra comfort, there are suspensions attached to both front and rear. Aeroactive also used ABEC 7 carbon steel bearing which is excellent in giving a smooth performance. To stop the scooter, a step-on rear wheel friction brake is in place. The folding mechanism of this scooter is also very unique and effective. The entire T-bar is three-step adjustable, one position for riding the scooter, another for parking it (there is no kickstand as it does not need one) and the last step is to fold the scooter. After folding, the scooter is compact enough to adjust into any place. There is also a carrying strap attached to it which makes it very easy to carry around. There is also a bottle holder attached to the T-bar. The frame and deck are made of solid aluminium. It is lightweight weighing 13.5 lbs. Aeroactive scooter has dual suspension. Both, front and rear suspension, give a very comfortable smooth ride. The 8 inch wheels make the ride more comfortable and these wheels are ideal for larger glides. The large wheels are much better for a smoother and safer ride, plus they limit the risk of going over the bar. This scooter is easy to fold, carry and transport. The carrying strap makes it even easier to carry around. The adjustable height of the T-bar also makes it perfect for rider of all heights. The height can be adjusted from 37 inches to 41 inches. This is a bicycle without a seat and pedals – that was my first reaction to this scooter. Schwinn is a bicycle manufacturing company and they started making kick scooter for an adult with this unique bicycle style. The Schwinn Adult Shuffle Scooter is a large hybrid push scooter, reminiscent of kick bikes in Europe. The effortless design is very nice and “bicycle-like” handlebars that offer greater control over regular handlebars. This scooter has bicycle style wheels. Both the rear and the front wheels are spoke wheels, just like a bicycle. The front wheel is 26 inches in diameter and the rear wheel is 16 inches. For comparison, traditional mountain bike small wheels are 26 inches in diameter. Both the tires of this scooter need to be inflated like a bicycle. The frame is made of solid steel which makes it a really heavy scooter to roam around. The weight of this scooter is 25 lbs but it is designed to make it easy to handle. The deck is made of wood and really nice to look at. This scooter is almost 6 feet in length, so this is not something which is small and compact. This scooter is perfect for work out. Nice bicycle style design makes it look really nice. The large and wide handles make the handling very easy and comfortable. The wheels are big and spoked and give a smooth ride. The brakes of this scooter are rubber pressure brakes. Both the front and rear wheel has brakes and this scooter can be easily stopped by pulling any of the two brakes on the handle. This kick scooter comes from Germany. Hudora is a well known German company which makes short commute devices. Their products are known for superior quality. Hudora made no compromise in the quality of this scooter. The body frame is made of high-density aluminum alloy. Even the footboard is made of metal. No part of this scooter is made of cheap plastic or other low-quality material except the mudguard which is plastic made. The metal makes it a very strong scooter. It weighs only 11 lbs but it can take a rider weighing up to 264 lbs. The T-bar of this scooter has five adjustable heights. This makes it versatile and comfortable for a rider of any height. Both the handles have a very nice grip with rubber cushion around them. This scooter also has big wheels. They are 8.1 inches in diameter, are comfortable to ride and ease the handling. There is a friction brake on the rear wheel. This brake is very effective and needs to be stepped on. The scooter can be folded very easily from the hinge attaching the T-bar and the deck. There is a strap attached to the T-bar which comes very handy while carrying the scooter around when not riding. 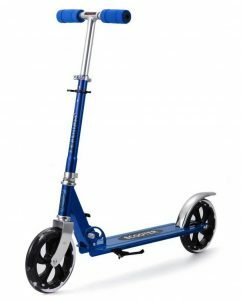 This scooter is made of high density durable aluminum alloy. The body is very strong and rigid. Hudora Big Wheel Scooter weighs around 11 lbs and the max rider weight it can take is around 264lb. It’s a safe and comfortable for both adult and growing teenagers. All the Hudora products pass the German GS safety certification. This ensures the high quality of their products. The height of the T-bar of Hudora Big Wheel Scooter is adjustable. The maximum height of the handlebar is 42 inches and the minimum is 32.7 inches. This scooter has two large wheels 8.1 inches in diameter. These PU wheels and very good in performance on all types of surfaces. Hudora’s scooter is easily foldable and very convenient to carry around. 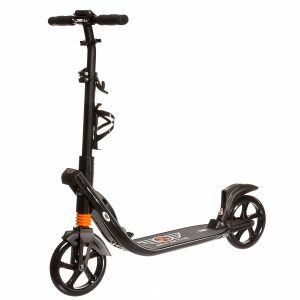 Fuzion Cityglide is a nice and affordable kick scooter. This scooter has an aluminum made body frame and deck. This made it very strong and rigid. The weight of this scooter is only 9.9 lbs and is considered to be a very light one. The metal made telescopic handlebar of this scooter is very strong. The height of this handlebar is also adjustable so that rider with any height can ride it. This height ranges from 29 inches to a maximum of only 36 inches. So if the rider is more than 6 feet, it will be very hard for him to ride this scooter. Wheels of this scooter are big. Both the rear and front wheels are 210 mm in diameter and these are PU wheels. PU wheels are low resistance and very smooth to ride. Also the bigger the wheels, the less effort it will take to speed up. Fuzion also used ABEC 7 bearings in these wheels for good performance. To stop the scooter, there is a friction brake attached to the rear wheel. You just need to put your foot on it and press. This brake works fine and stops the scooter immediately. To carry the scooter conveniently while not riding on it, you can fold it up. Though Fuzion Cityglide’s folding mechanism is not so smooth and it might take some effort to fold it. This scooter is also available in three different color options. The dimension of this scooter is 35 x 4.5 x 33.6 inches. The frame and deck are made of aluminum so it is very light and strong. The weight of this scooter is 9.9 lbs and the maximum rider weight is around 220 lbs. Fuizon Cityglide has wheels of diameter 210 mm. These are PU wheels and very good in performance. This scooter has a step-on friction brake attached to the rear wheel. The telescopic handlebar is adjustable in height with a range from 29 inches to 36 inches. This scooter is foldable and easy to carry around. Ancheer kick scooter is a very nice and affordable one to buy. For that price, they are offering a very good quality scooter. The chassis and the deck are made of aluminum alloy. Overall the scooter is strong enough for an average adult to ride on it. The maximum rider weight it can take is around 220 lbs, but we recommend a rider weighing below 180 lbs should ride this scooter. The scooter is also very lightweight and weighing around 13 lbs. The telescopic bar of this scooter is very strong and rigid. Its height can be adjusted and it has four levels of height adjustment. The minimum height is around 35 inches which is fair enough even for a teenager and the maximum height is 39 inches which make it a good ride for a tall person as well. This scooter has 195 mm wheels on both rear and front. These are PU wheels and are very smooth and quiet to ride. The big wheels also reduce vibration. For an extra smooth ride, this scooter has shock-absorbing suspensions attached to the telescopic bar and also to the rear wheel. These suspensions boost the riding comfort. For safety, this scooter has a reflective tail light. This scooter is very compact and easily foldable. Once folded, it can fit very easily inside the car’s boot or anywhere in the corner. This is very easy to carry along. This scooter has an aluminum made frame and deck. It is very lightweight scooter and weighs around 12 lbs. The height of the telescopic bar of this scooter can be adjusted as per the rider’s need. The maximum height of this bar is 39 inches and the minimum height is 35 inches. This makes it good for both tall and short person. This scooter has 195 mm big PU wheels. This wheels give a smooth and comfortable ride. The scooter has spring suspension attached to both front and rear. It also has a reflective tail light for safety. This is the second scooter from the German manufacturer Hudora in our list. First one was a premium scooter but this scooter has an affordable price range yet there is no compromise in the quality. When it comes to the building quality, Hudora offers the best. The frame, as well as the deck, are made of very high-quality aluminum. The metal body is very strong and can hold a rider of up to 220 lbs. But at the same time, this scooter is very lightweight weighing only 8.8 lbs. The telescopic handlebar has four adjustment levels. The minimum height is 31.5 inches and the maximum height is 40.9 inches. 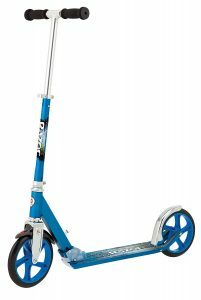 This wide variation in height makes this scooter suitable for a tall adult and also for a child in his/her early teens. This scooter has extra-large wheels. The diameter of both the front and rear wheels are 205 mm and both are urethane wheels. They are very smooth and make the ride very comfortable. This scooter can run smoothly in plain surface and also in a hard concrete surface. To carry the scooter around while not riding, it can be folded very easily. This also has a carrying strap attached to the telescopic bar. This scooter is very compact after folding and can be placed in any corner. The frame of this scooter is made of aircraft-grade aluminum. The reinforced metal deck is very strong and can hold riders up to 220 lbs. It is equipped with extra-large 205 mm urethane wheels. These wheels are very smooth to ride even on rough surfaces. It has very good and soft hand grips on both the handles. This scooter is easily foldable and weights only 8.8 lbs. This makes it light enough to carry around when not riding on it. It also has a shoulder strap to make a convenient carry and storage anywhere. This is another scooter from Fuzion. B200 is an upgrade to the previous Fuzion Cityglide and has some new features. Just like Fuzion Cityglide, B200 also has an aluminum frame. The deck is also metal made and looks pretty strong and rigid. The scooter weighs only 9.9 lbs. It is strong enough to withstand a rider weighing 220 lbs. It has 200 mm PU wheels for better performance. These are very smooth while riding. The height adjustable T-bar also makes this scooter suitable for everyone to ride. The minimum height being 29 inches, this scooter can easily be ridden by a child. But the maximum height of the handlebar is only 36 inches. So if your height is over 6 feet, you should consider buying another scooter. This scooter has a hand pulled brake. This brake is attached to the rear wheel and stops the scooter effortlessly. It is also easily foldable and available in two color variants. The frame and deck is made of aluminum. So it is very light and strong. The weight is 9.9 lbs and the maximum rider weight is around 220 lbs. Fuizon Cityglide has wheels of diameter 200 mm. These are PU wheels and very good in performance. Cityglide has a hand-pulled friction brake attached to the rear wheel. Razor A5 is a very popular kick scooter for adults. Razor became a very old and trusted brand in the commuting device market, not only has made no compromise in making this scooter but also kept the price very reasonable. Razor targeted this scooter to everyone, from an eight-year-old child to a full grown adult. The frame and deck are aluminum made and strong enough for a rider weighing around 180 lbs. Though Razor claims it to be fine for and rider weighing 220 lbs, we do not recommend this scooter to a heavyweight rider. The handlebar height can be adjusted to three different levels. This scooter has Razor signature rear fender brake for safety. Wheels of A5 Lux are urethane wheels. So they are good in performance and make the ride comfortable. If you want to buy Razor A5 Lux, you get an option of two different colors to choose from. Razor A5 Lux has aluminum made frame and deck. This makes the scooter strong and rigid. The scooter has two large urethane wheels. These wheels provide a smooth and comfortable ride. The height of the T-bar can be adjusted to three levels. This makes the scoter good for everyone. This scooter is very lightweight and weighs only 8.5 lbs. A5 Lux is easily foldable and can be carried very easily. 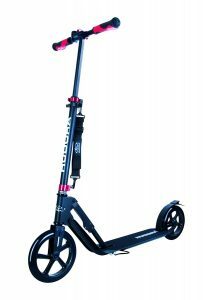 The last kick scooter in our list is the most affordable one available in the market for adults. The price-tag is maintained in the lower segment. The body is made with aluminum alloy. This allows the scooter to be very lightweight yet strong. It weighs around 8 lbs. This makes it decent for an average built person but not good for a muscular and heavy person. Both the rear and front wheels are 200 mm PU wheels. These wheels are very smooth to ride and also perform well on rough surfaces. To stop the scooter, a step-on brake is there attached to the rear wheel. The height of the handlebar is adjustable to four height levels. This makes the scooter suitable for the people of all heights including kids. The minimum height of the handlebar is 78 cm while the maximum is 93 cm. The deck is also long enough for an average guy. The length of the deck is 15 inches. The total length of the scooter is 35 inches. The scooter can be folded very easily. So you do not have to worry about it as it fits easily into the car’s boot space. Though Ancheer advertised the scooter for all adults, we do not recommend this to be used by any well-built adult. 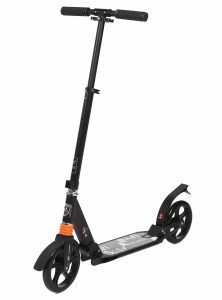 This scooter should be used by a rider who weighs less than 100 lbs which make it perfect for growing teens. This scooter has adjustable handlebar with 4 levels of height adjustment. The maximum height is 93 cm and the minimum is 78 cm. This scooter is equipped with super smooth and high durability 200mm PU wheels on both rear and front. They are both smooth and quiet. High quality bearings are attached to these wheels which reduce vibration and make a smoother ride. 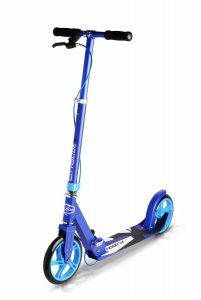 The scooter is made of aluminum alloy and weighs 8 lbs. 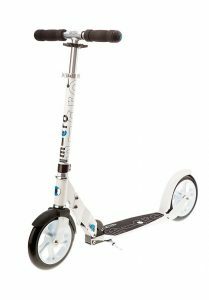 If you are an adult and want to buy a kick scooter for your short distance commute, do not just go to the market or Amazon.com and buy one blindly. Instead, consider some of these things before buying. Height. Yes, you must consider not only the height of the handlebar of the scooter but your height too. Consider your height first and then see the adjustable heights of the handlebar. If the height of the handlebar suits your height, then go for it. Weight. Here you should consider your weight, not the scooters. Before buying, check if the scooter is strong enough to take your weight. Wheels. You should definitely check the kind of wheels and also the diameter of them. Large wheels are good for a smooth and fast ride. Also, a good quality wheel will give you much more comfortable ride than a low quality once. Compactness. 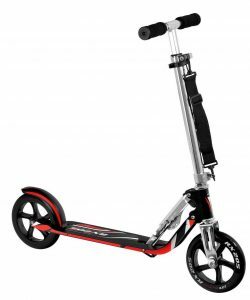 If you want a kick scooter for you day to day use, you should definitely check if it is foldable and how easily you can carry it. You do not want a bulky scooter which you cannot even fold and have to drag wherever you go. Well, it is time when I tell you about my favorite scooter and the one which I want to buy myself. Based on all my needs and considering my mid-weight athletic body type, I will go for AeroActive’s scooter. The scooter is very strong and compact. Apart from all its features, I personally liked its unique design a lot.